I have been a lover of Cascadian metal the earthy tones and mix of dark and light is distinctly appealing to me, it showcases how glorious true metal can be with magical twists and turns and sounds that come straight out of the forest. The new release from Moss of Moonlight Winterwheel is no excuse to this trend of greatness. An album that is filled with powerful songwriting and beautiful melodies Winterwheel will never leave you bored. 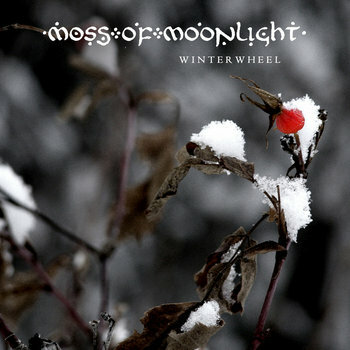 In the vein of bands like Agalloch and Wolves in the Throne Room Moss of Moonlight clearly know what they are doing and that makes Winterwheel one of the better black metal releases of the year. I love the raw power that makes itself prevalent in the music. This power comes from the earth, the mountains and the trees that make up Cascadia. The lyrics are very much in the nature praising vein too. One segment of the song Eole runs "Moonfed this moss, sky-torched our trail a soothspell of caves, at season's end we seek you for we are all Pagan, children of cinder eaters of seed, walkers of wheels." Suffice to say this is definitely music to be listened too while walking through the woods. The mix of cleans and growls, male and female alike help to make this album truly special, it gives the music a whole new depth and keeps things constantly interesting. In conclusion if you're looking for an album that calls up all of the might of the elder races and the eternal power of the universe then Moss of Moonlight is the band for you. Their music is simply so pure and honest, it feels like a natural development of the lives of musicians themselves. It just works, the sounds on this record are natural and elegant. Beautiful and encapsulating this four track album represents some of the best black metal you'll hear all year. There is a lot to digest here and I for one can assure you that I will have it on heavy rotation for a while yet.